Is it safe to drink tap water in Dubai? All the new comers to Dubai, especially from the western countries, have asked this question – is the tap water safe for consumption in Dubai? We are going to tell some facts and break some myths along the way regarding water quality supplied by DEWA (Dubai Electricity & Water Authority) in this article. First things first, Dubai consumes packaged water 10 times more than any other city in the world. That’s a jaw dropping statistic. Since most of the Dubai residents are expats, its safe to assume that they do not believe in the quality of water supplied to their homes by DEWA. The water supplied to your homes is desalinated by the authorities via a Desalination Plant. In simpler terms, 99% of the water supplied in Dubai is from the ocean after it has been treated in the Desalination plants to make sure they are fit for human consumption. DEWA has assured all citizens that the water supply is safe and fit according to the World Health Organization’s (WHO) water standards. They employ very costly procedures to clean and desalinate the water and then supply it to the homes across Dubai. According to a research, “tests for bacteria in tap water in Dubai are consistently less than 100 colony-forming units per milliliter (acceptable limit is 500 units/milliliter), while most water dispensers across Dubai have found to have safe limit of 200-300 CFU’s per milliliters. This should safely conclude that the water supplied in your homes is perfectly safe for everyday consumption like cooking, washing, cleaning, bathing, brushing teeth and even drinking. Some people do not like the taste of the desalinated water, which is why the demand for bottled water is super-high in Dubai. The better solution to this problem would be a good quality water purifier under the sink or on the taps to provide best and cost-effective drinking water as compared to bottled or mineral water which, let’s face it, is an environmental hazard with all the plastic and the relative carbon foot print it leaves. According to a study, “By 2050, there’s going to be more plastics in our oceans than fish.” So think about limiting plastic bottle usage to save the environment. The complaints about unhygienic water also arise from uncleaned & ill-maintained water tanks, pipes, taps and faucets. Let’s face it, what was the last time you thought of cleaning your water tanks or piping system? We do not think about it unless the color of the water supply in our homes turns anything other than clear. According to the Dubai Municipality, it is highly recommended to clean your water storage tanks every year and get them inspected every 6 months. There could be debris, sand, bacteria & rust inside your pipes and water tanks, therefore, it is practically mandatory to clean them regularly for the sake of your health. Water Tank Cleaning Dubai may be the answer to all your water supply related issues. The water supplied by DEWA is perfectly safe, it’s the supply from your water tanks that you need to worry about. The hot environment of Dubai also promotes development of bacteria and allergens inside the water tanks, therefore, getting them inspected regularly should be a priority for you. SaniH2O by Saniservice is a leading Water Tank Cleaning & Disinfection company in Dubai. We use Swiss chemical-free disinfection process to clean your water storage tanks. 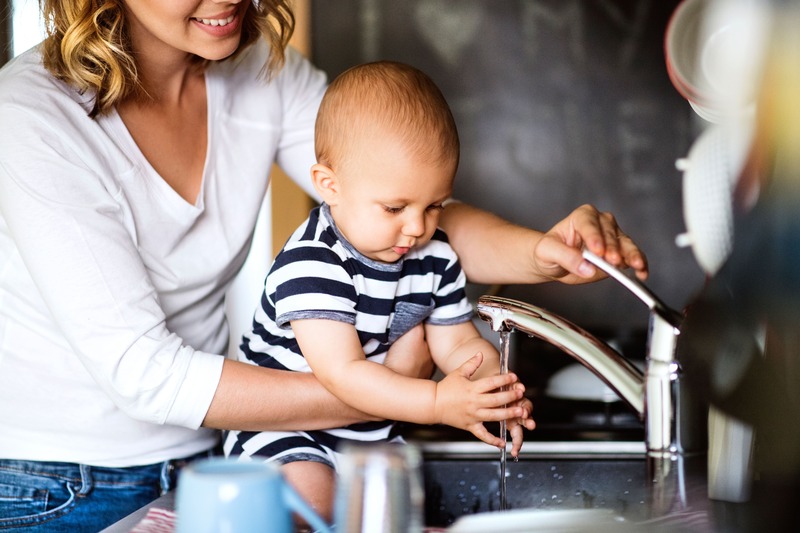 We also provide you with a 3rd party laboratory test results of your water after cleaning your water tanks, so that you are sure that the water you consume is perfectly safe for you and your family. Get a free Water Tank Cleaning Inspection from Sanih2o today. By admin| 2019-02-04T08:49:52+00:00	February 4th, 2019|Blog|Comments Off on Is it safe to drink tap water in Dubai?